As a teenager in the 1960’s, that long awaited moment arrived. It was time for my first car. Like most teens I was absorbed in emotion and ignorance, and prone to making bad choices. I have since learned that parental advice to teenagers takes about 10 years to sink in. The older young adults get the smarter Mom and Dad get. My kids agree. 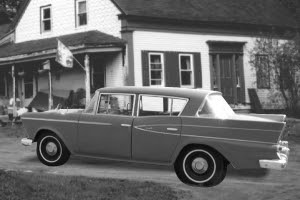 The car shown in the photograph is a 1959 Rambler 4-door sedan, the big red box, and at $75 it was a bargain. It truly had been driven once weekly to church and back by a kindly old man, and when he passed the wife didn’t need it because she didn’t drive. The body was candy apple red and had very little rust with an immaculate interior… as I now fondly recall. At the time, however, I gagged. The Rambler was nice, but definitely not cool. Again, looking back… I was more like the car. Square, not cool. The next choice was a 1962 Ford Falcon Futura with bucket seats and a stick shift on the floor. At $600 from a used car lot the price was a tad high, yet I bought it anyway despite the parental advice. There was no internet to check vehicle history, but then I found out more from people who knew the owner from Dover-Foxcroft. The young man used to race the sucker in fields and, or so I was told, needed bananas in the gearbox to keep her going! I joined the military a couple years later, and left the Futura in the care of one brother. It was gone when I returned,and to think that for another $75 I could have had them both and put the big red box in storage. Kids, listen to your parents. They only appear number than a stick which you may not appreciate until you’re pushing 30.